England's Michael Keane during the walkaround at Stadion Stozice, Ljubliana. PRESS ASSOCIATION Photo. Picture date: Monday October 10, 2016. See PA story SOCCER England. Photo credit should read: Mike Egerton/PA Wire. RESTRICTIONS: Use subject to FA restrictions. Editorial use only. Commercial use only with prior written consent of the FA. No editing except cropping. Call +44 (0)1158 447447 or see paphotos.com/info for full restrictions and further information. Michael Keane’s first senior England call-up can only benefit the player and Burnley, says Sean Dyche. Keane was an unused substitute in both World Cup qualifiers against Malta and Slovenia, as Burnley – before Tom Heaton’s withdrawal – had two players in the squad for the first time since 1974. 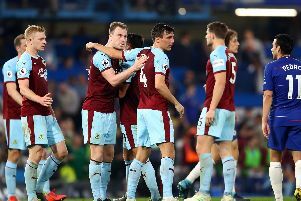 The Clarets had as many players in the squad as Arsenal, Liverpool and Manchester City, and one more than Chelsea. Dyche said: “Gareth Southgate knows Keano from the Under 21s, and he’s started the season in good fashion. “He’s still learning, but he’s doing a good job. “It’s good to have outside influences, and to learn about how the group with England works and the training levels etc. “It’s good all round, for an individual’s development, and for us as a club. “It’s win-win and one of many things I’m proud of here.